For those who haven’t yet met her, this is Blythe. In the last year, since setting up my blog and finding Theeradech Sanin’s crying dolly at Freedigitalphotos.net the night I decided I needed a personalized header, thus guiding a bit of a dolly theme over here, I’ve learnt a bit about dolls. I quickly discovered that Blythe here is kind of big deal. Among other things, she’s big in Japan. And she huge on Pinterest. 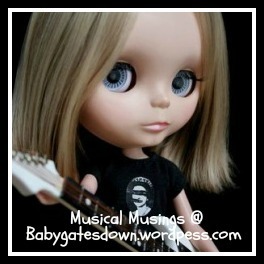 Feel free to peruse my Dolly Pinterest board for a gateway into the Pinterest Blythe underworld. Given the reading I’ve done about how I should be focussing on Pinterest to build my blog following, I quickly asked Blythe here to help a mom out and co-host my weekly music posts. As you can tell from her expression, she was beyond thrilled to be asked and so has been co-hosting here with me for the last few weeks as I work my way through my current musical blog challenge inspired by Jackie over at Ambling and Rambling: A Musical A to Z. This week I’m at M. On a mom blog. So how can I not pay a little musical homage to who we are and what we do? So some of you might have heard of this Disney movie out there called Frozen? Like Blythe, it’s kind of a big deal. In the way that my 4-year-old knows all the words to this song and sings it with Barbie Princess and the Popstar conviction. Finding this video and Deva’s blog last night? Just another reason I love both blogging and the Internet. I can’t wait to peruse the rest of her stuff at my leisure. But for those of you who might be more classic rock than Disney, how about this one instead? I can’t believe I’d never seen this before last night. Google and YouTube are wonderful. I did a bit of googling to double-check, and yes, it was done by a Church. I don’t see this happening at my church, but so very creative and funny. Enough parodies? How about musicals? I rediscovered this film when I was on parental leave with my eldest back in 2010 and use to sing it to her when she was crying, mostly to entertain myself. But I think the reasoning’s sound. When you’re good to mama? Mama’s good to you. I’ve seen the musical as well as the film, but I think Queen Latifah is absolutely perfect in this role. Are we ready for a break from us singing about us? I was pretty excited when I found this video. And discovered that Slash (formerly) from Guns N’ Roses wrote the music. Lovely combination of so much of the music I loved during those formative years when music really REALLY MATTERS to you. I loved Guns N’ Roses and Lenny Kravitz? Well, he’s just beautiful, so I’m now wishing I’d been old enough to catch the Use your Illusion tour in 1992. In Paris. I suspect if I’d asked, my mama would have said no. Which would have been the right call. Like I wrote in my post last week about the choice to work or stay home with kids, she was a good – nay – a great mother. Here’s a last one that, on top of being one of my favourite songs of all time, I think sums up everything I want to be as a mom. So that’s where I landed musically this week. Have I missed any great mom songs? If so, I’d love to know about them. Please list them in the comments! 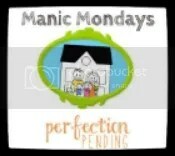 It’s Monday, so I’m linking up with Meredith’s Manic Monday Blog Hop over at Perfection Pending and again with Mommy A to Z’s parenting hop as well. If you head over to Mommy A to Z, you might notice that she was kind enough to feature my post from last week on why I chose to work rather than stay home as a parent. I’m very honoured and appreciative of the recognition. They are both great hosts with great hops. Do spend some time visiting those posting there. Oh! And if you liked my post – or my blog – show a blogger a little love and give me a vote over at Top Mommy Blogs. While you are at it, while surfing around the hops, spread the bloggy love to other Top Mommy Bloggers given a number of the other blogs on these hops are members too (including both awesome hosts). This was a great post, Louise! I had fun listening to the songs you posted, and I had one of my “musical appreciation” classes with my eldest so she would understand the era behind some of the music I was singing along to. It’s one of the ways I keep her learning during the summer so her brain doesn’t go to mush. Thanks so much for this post! Now I’m interested to know what else it is you cover in “music appreciation class”. Was it an in depth debate over Use Your Illusion vs Appetite for Destruction (because that would be awesome)? Possibly the underappreciated/may it never be forgotten talents of Will Smith? I see a post on this in your future…. I tried to give my tween a sense of a lot of the music that came out around the same time, along with other songs by the artists. She likes some of it, and turns up her nose at other sings/artists. We’re huge Will Smith fans here! Summer isn’t summer without boogying down to some of his music! I’m sitting on my hands, trying not to play too much from him, or any other artist. I have no comment. Singing mamas make me feel swoony. Nice! Us moms do what we can. Keep on keepin’ on. That’s all i have to say. Moms rock. Hey, it’s your post, you choose the artist. Haha! Tom Jones it is! Great collection of songs! Who knew Blythe was so big on Pinterest? I do now, thanks to your blog! I will be following her adventures with you for sure now! Yes – HUGE on Pinterest. I didn’t even know about the dolly until I started looking for free doll images online and found her, well, everywhere.